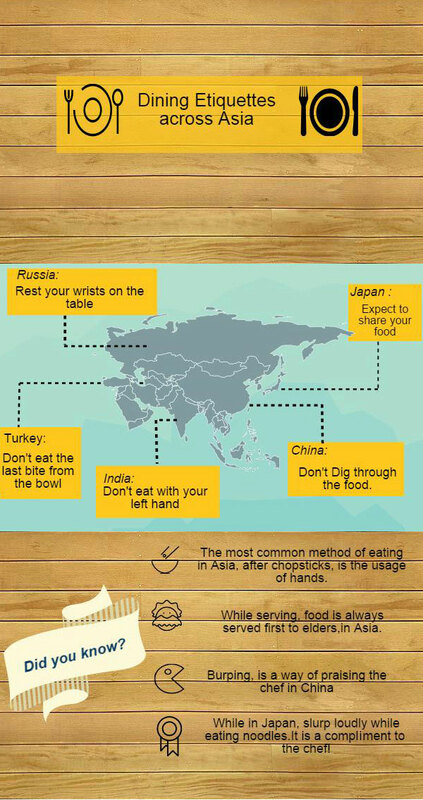 The debate of dining etiquettes across the world rages from 'what to do?' to 'how to do? '; the desperation to not offend: being every man's primary concern. Very often a practise that is probably considered normal by one, is shunned upon by other. In such a dilemma where you want to hurt none, but please the lot - one ends up not doing anything at all! While the motive is simple and good, it may get a little confusing at times - we agree. However, the solution to this is easier said than done. We solve the mysteries behind the dining etiquettes and bring to you simple ways of appreciation in the gastronomical world, simply- on a platter. Read on to know more. Now that you have your dining problems almost (dis)solved, get yourself an air ticket to these Asian gastronomical paradises, where each bite can teach you the way to attain nirvana!